Our topic for September was ring slings and pouches. These two types of carriers share many features – they’re both one-shouldered carriers, they’re both ‘poppable’, and they’re both fairly easy to get the hang of. This post will cover ring slings, including information on the ones available from our library. Open tail ring slings – the fabric that passes through the rings and hangs down is called the tail. In open tailed ring slings the fabric is left loose and flowing. The advantage of this is that it’s very easy to adjust each edge (rail) of the sling to get a perfect fit. The fabric can also be used as a sun shade or to provide privacy while feeding. However, some people find they don’t like a lot of fabric hanging down. Because they are so adjustable, they suit all body types and can be used for tummy to tummy, cradle, hip and back carries so are very versatile. Closed tail ring slings – these carriers usually have padding along the rails and the fabric that that passes through the rings (or in some cases clip) is sewn together so it’s much smaller than the rest of the fabric. This makes for less fabric dangling but it also means this form of sling is harder to adjust as you can’t easily adjust each rail separately. Because of this, they’re really only suitable for cradle carries for newborns and then hip carries for older children. Positioning – start with the sling threaded through the rings, making sure it’s not twisted and is moving easily through the rings. Place diagonally over your body, with the shoulder bit on whichever shoulder feels most comfortable. Make sure the rings or clip are near your shoulder to start with – once you tighten they’ll end up around corsage height. Make sure the fabric is spread out on your back and not twisted. Place baby in the sling. If in a tummy to tummy position, have your baby upright in the middle of your body. If in a diagonal cradle (baby’s head close to the rings), your baby’s head should be just resting on the outside rail and their head further away from your body than their bottom. If in a nursing cradle (head opposite to the rings) their head should again be just resting on the outside rail and their body nearly horizontal (head slightly raised). In a hip carry for older babies, they should be straddling your hip with their legs out the bottom. Adjust the rails so that your baby is high and snug, tucking fabric between you and your baby if their legs are out. For specific instructions, see the Slingbabies instructions for tummy to tummy, diagonal cradle, nursing cradle, hip carry, closed tail. The Zolowear page is also a great resource for instructions, including videos and troubleshooting. Pros and cons – ring slings are generally easy to adjust, so are great if you’re swapping between wearers of different sizes. They’re very poppable, so you can take your baby in and out easily. This means they’re a good option to keep in the car for shopping trips or school drop off. They’re great for newborns and also great for older toddlers who want to walk places but get tired (even if they’re heavy, it’s a lot easier than just carrying them in arms). They fold up nice and small too to keep in your nappy bag. They also come in some beautiful fabrics, and can be a very ‘dressed up’ babywearing option. They’re also fantastic for breastfeeding on the go as it’s very easy to shift your baby to breastfeeding position then back up again. The tail can also provide privacy or sunshade if desired. 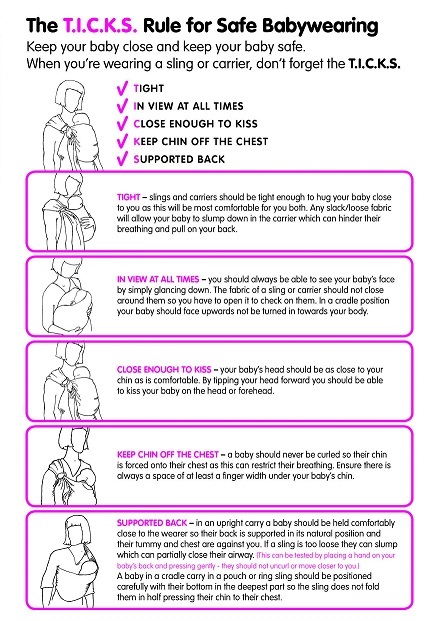 The main downside to ring slings is the fact that all your baby’s weight is on one shoulder. This means that they’re not the best option for extended periods of wearing. They can also be difficult to get right if you have an older baby/toddler who likes to straighten their legs. Breeze Baby ring sling (open tail) – this ring sling is designed to be used in the water or hot climates, as it’s made from a quick drying, breathable polyester mesh fabric that won’t get weighed down in the water. The fabric is slightly slippery which makes it easy to adjust through the rings but because it’s so lightweight it’s not the best option for extended wearing or for older children. However, it’s fantastic for taking your younger baby to the pool with your older child, or for wearing your baby in the shower. One of our committee members loved using this with her baby when her baby needed frequent showers to help congestion from a cold. A much easier option than trying to hold onto a slippery baby! Thanks again to Babes in Arms for donating this sling. Storchenwiege ring sling (open tail) – this German-made ring sling uses the same specially woven fabric used in Storchenwiege’s woven wraps (including the same beautiful colourways). Storchenwieges are known for their support and strength which makes them great for older children as well as newborns. I can still wear my nearly 3 year old comfortably in this sling! This sling is also nice and wide so it’s easy to get a great ‘seat’ for your baby in a hip carry. The weave, like in woven wraps, is designed to have diagonal stretch which moulds around your baby’s back. The fabric flows well through the aluminium rings so it’s really easy to adjust but stays put once you’ve tightened. The shoulder part is pleated and cups your shoulder nicely to spread out the weight well. The width across your back also helps with weight distribution. Included is an excellent instruction manual with illustrations of the various carrying methods, including a back carry. Thanks again to My Natural Baby for donating this sling. 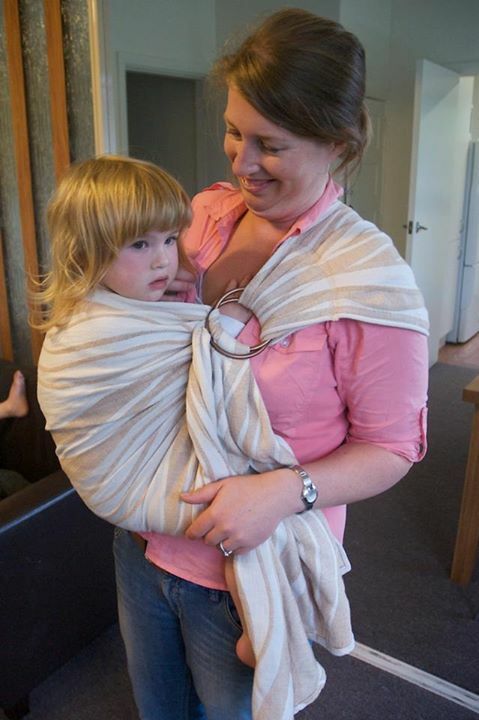 Unity ring sling (closed tail) – this New Zealand-made ring sling has a closed tail but is open at the point the fabric goes through the stainless steel rings. This allows for adjustability with less fabric hanging down. The sling is designed to naturally form a pouch to help you put your baby in either a cradle, hip or back carry with ease. The rails are padded for comfort and the fabric is wide across your back to help distribute the weight. There are lots of different colourways available and the slings come with detailed instructions. Thanks again to Unity Baby Sling for donating this sling. Natures Sway sling (closed tail with buckle) – this New Zealand-made sling uses a buckle and safety loop instead of rings for ease of use. Natures Sway has recently updated these slings. We have an older version (featured here) and have just been given one of the new ones. Like the previous version, the new one has a line of diagonal stitching in a contrasting colour to help you achieve the correct diagonal cradle position. This is a great feature as this can be tricky to get right when you’re learning. The new version has flatter wool padding on the rails for a closer fit and the same wool padding on the shoulder for comfort. The wool helps wick away moisture in hot weather too. The best new feature is a double adjustor on the back of the sling to help you adjust each rail individually (which is normally hard or impossible to do with a closed tail ring sling). And like the previous model, the new one is made from either 100% cotton canvas or an organic blend of 55% hemp/45% organic cotton. The slings come with instructions and there’s also video instructions available on the website. Thanks again to Natures Sway for donating these slings. Peanut Shell sling (closed tail with buckle) – this American-designed sling uses a buckle and safety strap instead of rings. Like other closed tail slings, it has padded rails. The sling forms a pre-made pouch which is a good size and moulds well to your baby as the fabric is made with a slight stretch. The slings come in a variety of pretty fabrics. Unlike traditional ring slings, these slings have limited adjustability. They’re more like a pouch that can be resized between different wearers. Just like a pouch sling, the lower part of the sling is meant to be no lower than your hip bone, and there’s a curved seam to place your baby’s bottom against as well. Thanks again to Babes in Arms for donating this sling. Jan Andrea from Sleeping Baby Productions has a great tutorial on how to make your own ring sling. 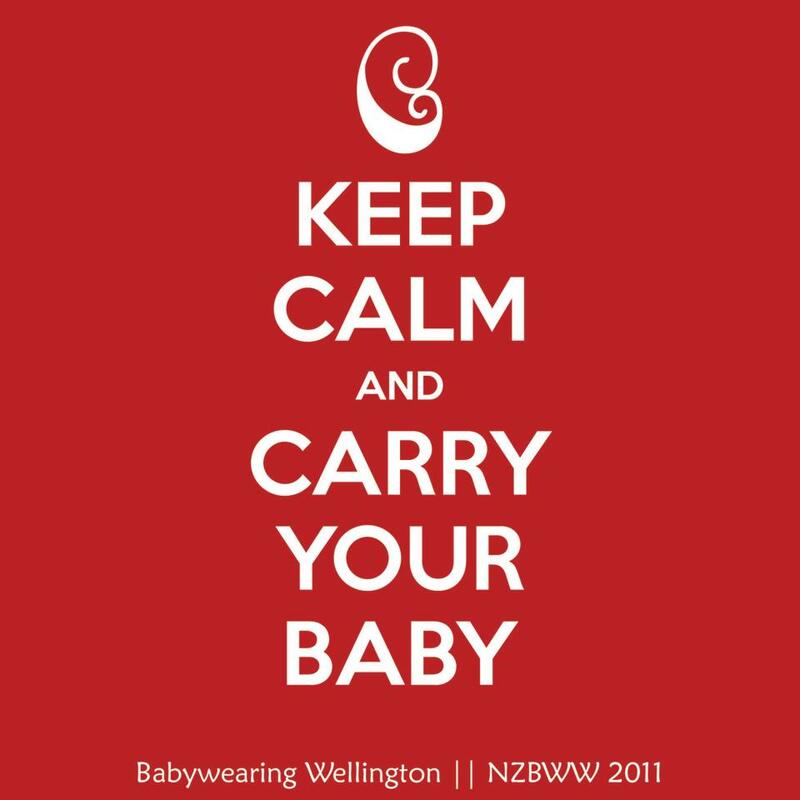 Make sure you only use sling rings approved for baby carrying (either aluminium or stainless steel). Rings available from www.slingrings.com and http://www.nudeyrudey.com/categories/sling-rings/black-sling-rings. They also pop up on Trademe from time to time. Tags: Breeze Baby, donations, Library, Natures Sway, Peanut Shell, pouches, ring slings, slingmeet topics, Storchenwiege, Unity. Bookmark the permalink.